In most states, hens and poults are legal birds. Though the meat yield is generally just a few pounds apiece, it’s the best white meat you’ll ever taste. When deer movement slows, get out and lay down some white meat. It's common for folks to add a fall turkey permit or two to their pocket in case an unsuspecting flock wanders just a little too close to their treestand while bowhunting for deer. Fewer folks actually dedicate hunts specifically to fall turkeys. Some reason that it infringes on their deer-hunting time. Others deem it senseless to invest time and money into a hunt that yields as little as five pounds of meat or less. These are somewhat-valid points, but let me reason that it's the fun and experience, first, that make fall-turkey hunting alluring. And, with some knowhow, that measly five pounds of meat could be some of the finest you'll eat all year. Plus, what else are you going to do when it's too hot or the wind direction is wrong for your deer stands? Now, if you've never hunted fall birds or have had little success doing so, I'm outlining five tips that will help you learn the curve and waylay a fall turkey or two. Let's review. Many folks who hunt spring gobblers never step foot in the fall-turkey woods. If that's you, let me start by saying that fall turkeys rarely behave like spring turkeys. Plus, hens and poults are legal in most states, so you aren't necessarily hunting toms. Aside from the occasional gobbling that happens on rare fall mornings when the stars align, you won't be locating birds to hunt by listening for gobbles at dawn. However, fall turkeys do make a racket. Hens yelp frequently, and poults create a whistle often followed by yelping. Hen and poult flocks keep continual communication to ensure everyone is in the ranks. Leaf tossing is another sound you'll hear on calm autumn days. And when there are crunchy leaves on the ground, a flock simply meandering through the hardwoods sounds like an army. While listening for hen/poult talk or tossing leaves can be productive, I instead prefer to drive back roads rich with agriculture to find birds to hunt without stepping into the woods. Nearly all of my fall turkey success generates this way, and most landowners happily grant access. In fact, most farmers kiddingly tell me to "shoot 'em all." In my area, turkeys are rather plentiful, so finding a flock generally takes little time. Plus, I've been hunting fall turkeys for years and have several farms at my disposal that are absolutely money each fall. I suggest taking a pair of decent binos along on your scouting drives. Places to glass are hayfields in early fall and picked cornfields mid-fall through the end of the season. As for timing, I usually take my drives an hour or two after dawn or flydown. This tells me where the birds hang out after they fly down, as hunting roost sites is dicey. Of course, if you can set up quietly in the pitch dark, then hunting a roosting area in the morning can be productive. This is easier done with a shotgun than a bow. During my early fall turkey hunting days as a teenager, I'd often bowhunt a hayfield or picked cornfield from a blind to observe bird movement rather than scout. Fall turkeys are generally patternable. An observation set can yield a shot opportunity, but at a minimum you can see the specific areas turkeys are frequenting and move in for the kill the following day. While targeting hen/poult flocks, placing one or two realistic decoys within shooting range can be wise. Fall hens and poults can be inquisitive, and a hen decoy can draw them in for a closer look. Hens can also be territorial, so it's possible one could respond out of anger, even attacking the decoy with pecks, kicks and wing jabs. In any case, I've never had decoys ruin my fall hunts. In fact, one September while targeting a 10-tom flock, I placed a strutting jake decoy in the large hayfield I was hunting. I did it because the turkeys didn't seem to favor any particular portion of the field, and I needed to try something creative in order to bow-kill one of them. The first morning I hunted them, all 10 toms came in from 250 yards away, several posturing next to the decoy 18 yards away. I thumped the lead tom just before he attacked the decoy. Yes, decoys have a place in the fall-turkey woods. One of my favorite ways to shotgun hunt for fall turkeys is to spot and stalk them. It might seem impossible given a wild turkey’s keen eyesight, but I've claimed a heap of birds using this strategy. The best days to stalk turkeys are in roaring wind and when the ground can be negotiated quietly — powdery snow or damp leaves are best. It's also important to have terrain features or other natural obstructions at your disposal so you can remain hidden until you're within shooting range. 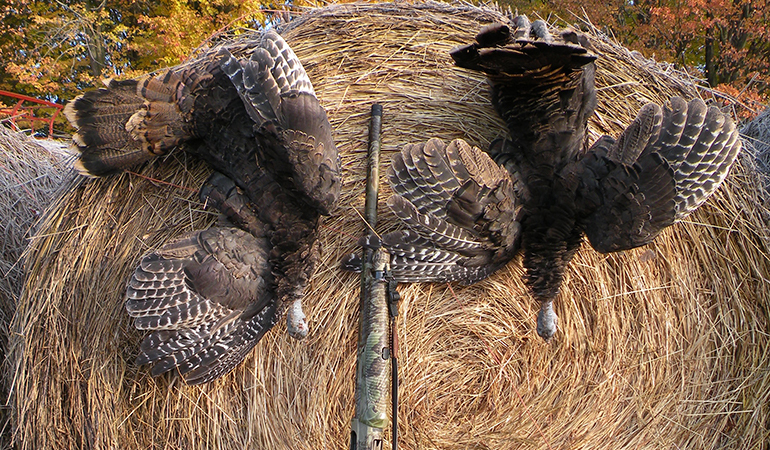 Fall turkeys often provide more than one shot opportunity, so if you have multiple tags, be quick on the gun. Many of my shotgun stalks end with a double, and that makes for a thrilling hunt. Once you bag a fall turkey or two, consider making the spoils part of your Thanksgiving or Christmas feast. Be sure to cut across the grain to ensure tenderness. Also, soak the chunks in salt water or buttermilk for 24 hours prior to cooking, which tenderizes the meat. I often batter and deep-fry breast chunks and serve them with BBQ or bleu cheese dipping sauces. If that, along with the other points I’ve presented, doesn’t interest you in fall turkey hunting, nothing will.